We got to chat with Frances and Simon from Bennett Day School, the inventors of Story Dealer™ story-telling cards, at the Chicago Toy and Game Fair (ChiTAG). And get this: the card game was invented at a school. "The mission of the Bennett Day School involves creativity and innovations, and we think that the students should be involved in design processes," says Frances. If they think of a product that they can't find, they make it and their students help them design it, and then they take it to market. "We want children growing up with that entrepreneurial spirit, that they can make things themselves." Yes, we can get behind that! The creative line of storytelling card decks known as Story Dealer™ currently include three sets, with more on the way! 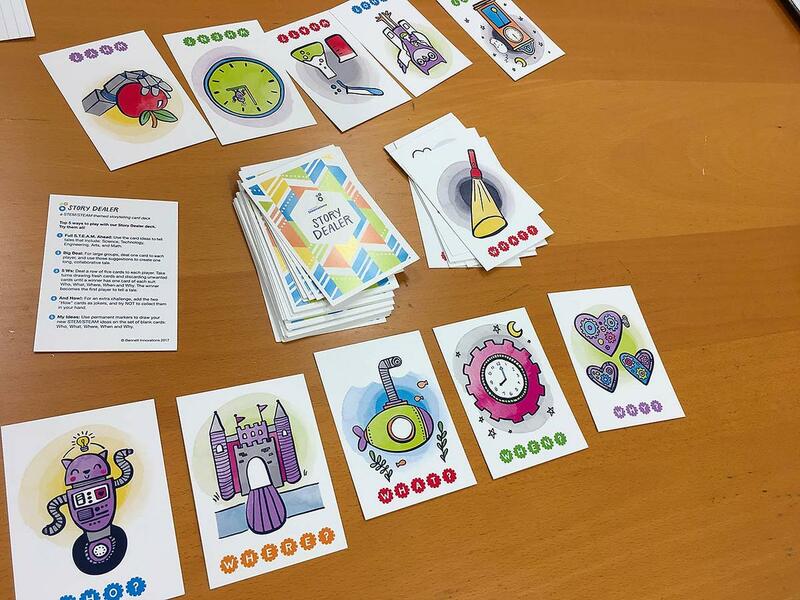 The 50 cards that comprise the STEM/STEAM set are designed to inspire open-ended tales in themes of Science, Technology, Engineering, the Arts, and Mathematics. Clever card-suits with colorful gears spell out the 5Ws: Who? What? Where? When? Why? These choices foster inquiry-based learning, creative writing programs, curiosity and critical-thinking skills. Charming watercolor robots, labs, habitats, clock faces, space themes and seasonal details are sure to inspire. The DIY Maker set is similar, yet they omitted the illustrations to allow your children to create their own cards in the suits of Who? What? Where? When? Why? This DIY Maker set was inspired by many creative children in their beta-testing group who remarked that they, too, would like to make a deck of Story Dealer™ cards. Learn more about the Bennett Day School and Story Dealer cards! I love that this game evolved from discussions in the classroom between students and teachers. What a great concept for a school - teaching innovation and entrepreneurship along with the curriculum! 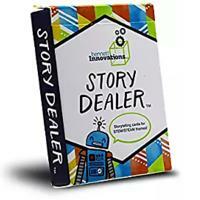 Story Dealer Story-telling Cards for Kids From Bennett Day School at the Chicago Toy & Game Fair (ChiTAG)!